We made it to the end of February! I don’t know about the rest of you, but February is always my busiest, craziest, most stressful month. My largest work event of the year is typically the third week of February so I spend the better part of the beginning of the month having nightmares about seating charts and name tags. Once the event was behind me, I decided to reward myself with COOKIES. Since finishing Whole 30, I hadn’t baked up any treats, and I had been dreaming about these cookies. 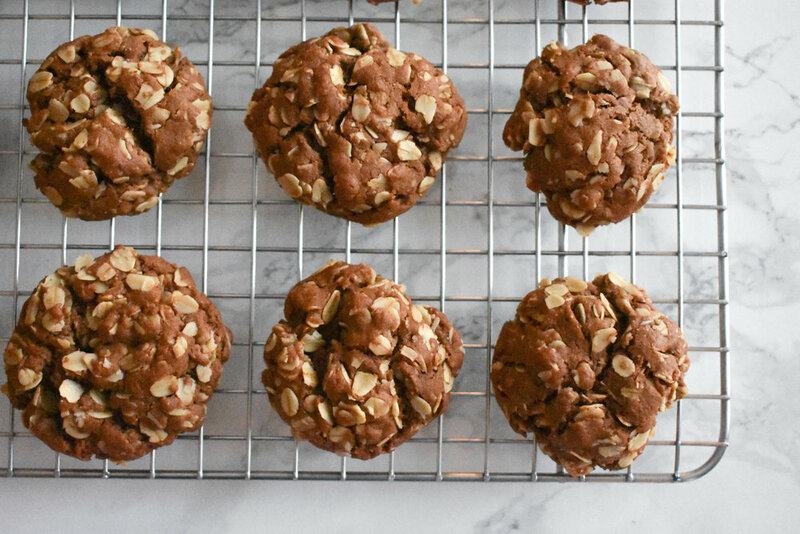 These cookies are everything you love about an oatmeal cookie without the unwanted raisins. They’re soft, delicious, and not overly sweet, while being the perfect combo of chocolate and peanut butter. I brought tons into work since the recipe makes so many cookies, but since they contain oats and healthy fats, I think you could almost say they’re a suitable breakfast? I’ll leave that decision to you. In a large bowl, combine the butter and peanut butter. Add in the sugars, eggs, vanilla, and baking soda and mix until creamy. Add in the cocoa powder and mix until fully incorporated. Spoon heaping tablespoons onto your baking sheet.